Anthropologist, author and broadcaster Alice Roberts has brought human evolution to life for millions of people through her popular books and TV series. She reflects on how the Museum, its scientists and collections have inspired her career and shaped her interest in what it means to be human. The Natural History Museum was a place that captured my heart as a child. I can only have visited it once or twice during my childhood, on rare visits to London. But this magnificent shrine to biology - the realm of science that was beckoning to me even in primary school - left an indelible impression on me. In these galleries, we can see the majesty and diversity of the natural world, appreciate the beauty and intricate design, and understand the immense depth of time that has turned ancient creatures to stone and allowed the gradual development of the diversity of life on Earth today. In this museum, we discover our own place - our own context, too - and quite rightly, as we are part of nature and subject to the same natural laws that have shaped every other species. I was delighted when, in 2013, Chris Stringer - who leads research into human origins at the Museum - invited me to contribute to a video for the Human Evolution gallery. I had my genome analysed and Chris interviewed me for the video, alongside a slew of other scientists, science communicators and enthusiasts. Remarkably, it turned out that I possessed a higher percentage of Neanderthal DNA than Bill Bailey. I don't know what that Neanderthal DNA is doing in me - the analysis wasn't that specific - but it's likely to include genes involved with my immune system. I don't seem to have inherited the Neanderthal gene for freckles, though, which is a shame. I had been aware of Chris and his work in human origins for many years by the time I came to make that video with him. I'd read In Search of the Neanderthals, which he co-wrote with Clive Gamble, when I was at university in the 1990s, studying medicine (but even then I was drawn to the science of human origins). I'd also read Chris's African Exodus - looking at the evidence for the origin of our species in Africa and subsequent spread around the world. I didn't imagine at that time that I'd ever meet Chris personally, much less end up working on a television series about human origins, with Chris as the principal consultant. I left university intending to embark on a career in surgery, but a six-month-long job teaching anatomy at Bristol University ensnared me. I loved anatomy, I loved teaching and I had the opportunity to do some research on archaeological skeletons. I also met a physical and forensic anthropologist, Jonathan Musgrave, whose interests ranged from the structure of Neanderthal hands through to the anatomy of ancient Egyptian mummies. My surgical ambitions were thwarted as I decided to stay where my passion burned brightest. And so I plunged into anatomy and osteoarchaeology, writing bone reports for archaeologists and the police, and starting work on a PhD focusing on identifying disease in old bones. I returned to the Natural History Museum, this time as a researcher. Walking along the corridor lined with Mary Anning's ichthyosaurs, past the giant sloth, I entered the looking-glass world of the Museum, where its researchers unlocked secrets from bones and fossils gathered from all over the world. For a while I joined them, focused on my own enquiry into the patterns of arthritis around the shoulder joint, looking at historical human skeletons as well as bones from other apes: gorillas and chimpanzees. I'd started to work in television too, by this time. I'd been privileged to work with Andy Currant, who was the Museum's superlative mammal expert, on a Channel 4 series. And in 2008, the same year I finally finished my PhD, I embarked on a five-part series for BBC Two, The Incredible Human Journey, with Chris's steady hand on the helm. 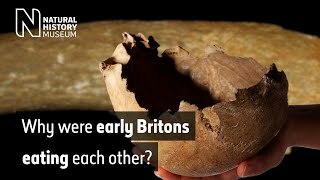 The Ancient Human Occupation of Britain project, which started out as a combined Natural History Museum and British Museum endeavour, drew plenty of media interest as it pushed back the dates for the earliest human presence in Britain from 500,000 to over 800,000 years ago. I covered the project on the very first series of Digging for Britain in 2010, on the windswept beach at Happisburgh in Norfolk. 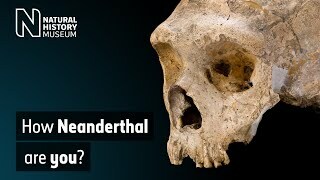 Then in the second series we featured Chris's research on the Ice Age human remains from Gough's Cave in Cheddar, including grisly evidence of defleshing - possibly cannibalism (since proven) - and the fashioning of skulls into drinking bowls. As I continued to make programmes on human origins for the BBC - Origins of Us and Prehistoric Autopsy - Chris was always there to offer expert advice. He invited me to contribute a filmed interview for a new human evolution exhibition. Having had that revelation that I'd inherited 2.7% of my DNA from Neanderthal ancestors, I was living evidence of interbreeding between our two species. 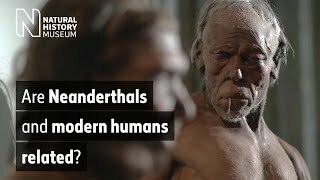 This general finding had come as something of a surprise when the Neanderthal genome was sequenced and compared with genomes of living modern humans. The first suggestion of interbreeding was published in 2010, and since then the evidence has piled up - many other ancient populations have contributed genes to us, Homo sapiens. We're now discovering that this theme of 'origin then spread with hybridisation' seems to be the pattern for a great number of species - from dogs to apples. The Natural History Museum continues to play an important role in British palaeoanthropology - the science of human origins. Its researchers push at the boundaries of our knowledge, share their wisdom and offer expert comment on wider research and discoveries. Its collections are real treasures, an invaluable resource for researchers as well as a source of fascination and inspiration. And in this nineteenth-century Romanesque cathedral of Earth and life sciences, the very latest ideas and revelations in geology, palaeontology, botany, zoology and - of course - anthropology are opened up to a wide and diverse audience. Almost two years ago, I came to the Museum on another pilgrimage, this time with my own small children in tow. And as they looked at the reconstructions of ancient human ancestors, models of huge whales, and the fossils of dinosaurs, ichthyosaurs and giant sloths - these endless forms most beautiful - I could see the wonder glimmering in their eyes, too. In her new book, Alice Roberts tells the extraordinary story of the species that became our allies, essential to our survival and success.